What I Packed: Two casual dresses, a light jacket, my favorite walking shoes. Tallinn is a city where old meets new, and preservation meets progress. It's a unique place, off the radar of tourists, where you can explore two completely different sides of one city. Inside the 16th century walls of Old Town, Tallinn is the setting of a fairytale. The narrow, winding streets are cobblestone, the candy-colored buildings are unrestored, and due to the caramelized-nut stands on street corners, the air actually smells of sugar. But just a short walk outside the ancient walls is a seedier part of town with graffitied pop-up shops, restaurants in old train cars, and an abandoned Soviet prison turned museum. The contrast makes for an exciting and unusual weekend in Europe’s best hidden gem. Tallinn’s history dates back to the 13th century. The original fortification still stands and buildings within were never destroyed by war. After spending a day there, you feel that time never penetrated the walls. Everything appears to be as it was in medieval times: slanted rooftops, shops selling thick, parchment paper and calligraphy pens, people in period dress and pointy shoes; if it wasn’t all authentic it would be the cheesiest place in the world. Tallinn is so picturesque you'd think you were at Epcot. I instantly noticed how quiet the streets were as we began to wander. Tallinn is not on anyone’s bucket list, so the usual hoards of tourists that flock to Europe in the summer were missing; there were no motor coaches, no herded groups, and not a selfie-stick in sight. The Old Town is easy to fall in love with, but the absence of tourists is the whipped cream on the pavlova. If you’re about to open a new tab and Google “pavlova,” no need. It’s a giant meringue, filled and topped with whipped cream and fresh berries. It’s absurdly sugary, the adult equivalent to pixie sticks, and looks like an edible cloud. The best part about pavlova is that my husband hates it, so it’s a dessert I get all to myself. The first place in town that caught my eye was, of course, a patisserie called Maiasmok. I got right to business and found and inhaled a pavlova. Covered in crumbs, I continued to Tallinn’s main square. My smile doubled when I realized it was devoid of metallic-painted street performers or people peddling counterfeit DVDs. Even the restaurants around the square were missing the typical waiter out front urging us to, “Come! Sit! Eat!” It was just peaceful and beautiful. Tallinn is so small that you can actually put the map away and just get lost exploring. Our day was spent aimlessly walking the streets, passing in and out of shops, playing cards, and eating delicious New Nordic food at shockingly cheap prices. Tallinn turned out to be a secret foodie paradise! The food was so incredible it warranted it's own post - you can check it out here. Since there are no museums or must-see attractions in the Old Town, we easily covered it all on foot in a few hours. It must be said that there is really nothing to do here in terms of museums, sights, or shopping; it is a place to just vibe, wander, and be charmed. And you could pack up and leave after one day having done just that, and never know that a ten-minute walk outside the gates is a neighborhood more hipster than Brooklyn. In recent years, Kalamaja has gone from a ghetto to an artsy paradise. Skyscanner actually named it one of the world’s twenty most hipster places! Old, wooden houses in various states of disrepair, dozens of dingy bars, and dozens of coffee shops and restaurants listed among Tallinn's best. We started at the neighborhood’s beating heart, the Telliskivi Creative City. This area was formerly factories that were abandoned after the collapse of the Soviet Union. With missing doors, chipping paint, and coats of graffiti, many people saw it as an eyesore. But the hipsters saw it as an opportunity. Slowly they came with their expertly-roasted coffee and their chia seeds. They opened shops selling locally-designed jewelry and printed t-shirts, and flea markets with fresh produce, Soviet propaganda, and baby dolls missing eyes. Every wall of the outside is covered in street art. It's worth exploring every colorful corner of it, and if you're looking for a place to buy some Estonian-designed things, this is the place. The area is full of young locals; I didn’t feel cool enough to be there. While I share a lot of the hipster ideals in terms of coffee, food, and politics, I am likely their very definition of basic. We passed so many great and cheap places to grab lunch in the neighborhood. F-Hoone, Fabrik, la Boheme, and even some food trucks right outside the temporary flea market. During my visit, the famous Balti Jam market was under construction, so a pop-up version existed instead just near the train station. We ended up eating lunch right next to it at Peatus, which is inside of an old train car with outdoor seating too. I was a sucker for the bean-bag chairs. The service was terrible, but the food was fantastic. From Telliskivi we walked north to pick up the Kultuurikilmeeter (The Culture Kilometer). I’m always up for a self-guided walking tour to end the day, especially when I’ve started my day with a pavlova and need to undo the damage. This 2km cultural walk takes you on a history lesson along the sea as you pass a mix of new museums and abandoned Soviet buildings. The crown-jewel of these is the Patarei Prison. 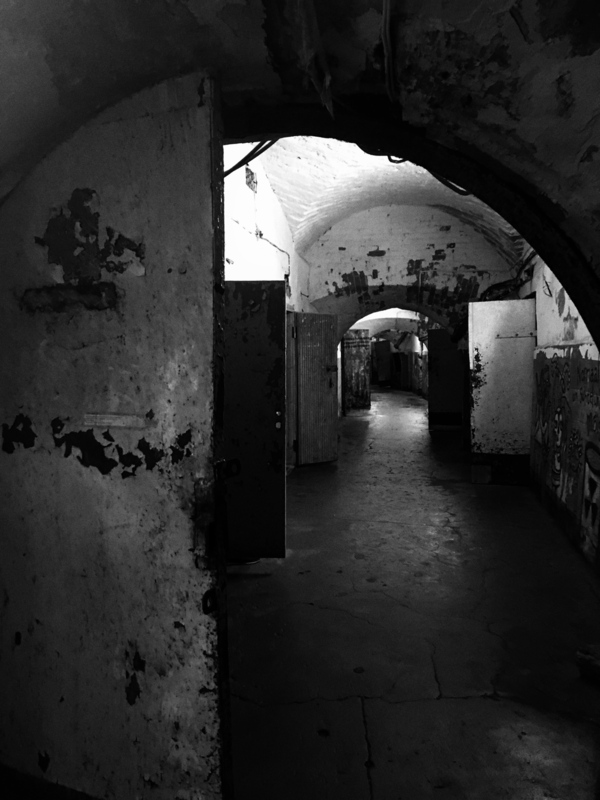 Patarei was built in 1840 as a fortress, but from 1920 to 2002 it functioned as a prison, and was run by the KGB during the Soviet occupation of Estonia (1944 to 1991). Today, the building is empty and functions as a “museum” only because no one wanted to pay to have it demolished. After handing over three euros to a bony, old women in a shed outside the prison gates, you’re free to go explore on your own. There are no exhibits, museum maps, or explanations - just a maze of endless, decaying rooms slowly being reclaimed by nature. It's spooky AF. The hallways are a horror film set. Rusted doors lead to cells untouched from the day the prison shut down. Broken bed frames and dirty mattresses, paint and pin-ups peeling off the walls, chipped mugs and other personal items that were just left there, and an acrid smell still lingers. Again, the absence of tourists makes this experience all the more eerie, since you can be totally alone at times. We passed the hanging room, the guard station, and the disturbing operating room, where a smashed typewriter, a padded chair with straps, and what’s left of an operating bed can only leave you to imagine the surgeries-gone-wrong here. Patarei is the most unique museum I've come across in my travels. It certainly takes the cake for scariest, least-well funded, and most-likely-to-give-you-nightmares. A visit here during a trip to Tallinn is a must. Outside Patarei, it was a short walk along the sea to Cafe Klaus and the Estonian Design Shop, where you can get a much needed pick-me-up drink and explore the quirky shop of Estonian-only designed products, like the tie apron. From there we were a few steps from the walls of the Old City, where you re-enter fantasyland. I have visited the “hipster” areas of cities before - it’s actually something I seek out wherever I travel because I love to get away from the city center and explore where the new things are happening. There’s always a bit of a contrast, but I have never seen anything like in Tallinn. So for your next getaway, if you can’t decide if you want to roam the cobblestone streets of a charming, old, European town, or you want to be in a artistic epicenter eating amazing food - then Tallinn is the perfect place to do both. And I can promise you, the only western thing you’ll see is the occasional basic white girl stuffing herself with pavlova.